A Diet High In Protein: Will It Help You Lose Weight? Protein -- high or low? There is a lot of debate about dietary protein. There is the high protein side. And there is the low protein side. One side says eat more. The other side says eat less. The US government, for example, is on the low protein side. They say you need 0.8 mg of protein for every kilogram of body weight. They say that is plenty. Bodybuilders are on the high protein side. They say you need 2 or 3 mg of protein for every kilogram of body weight. Well, you could debate that forever I suppose. And you might never settle the issue. But none of that helps you figure out what you need. It is true, you really don't need much protein in order to survive. In fact, you don't need much food at all. The human body is pretty tough. You can adapt to a lot of things. You can adapt to very little food. People survived harsh climates and famine and drought for many generations and thousands of years and yes, you can survive with little protein. So if you measure it all and you look at the numbers, which are kind of boring, you'll find out that you can actually get by with very little dietary protein. But all that means is that you won't get sick if you eat the low amounts of protein. See, you won't be clinically ill. But that is not what you are trying to accomplish, now is it? You are not just trying to avoid getting sick, right? And then you will sometimes hear that a diet high in protein can be harmful. 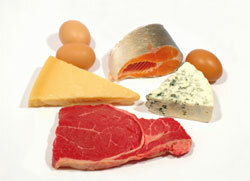 There is concern, for example, that excessive dietary protein can damage the kidneys. The truth is that protein will not affect your kidneys unless you already have bad kidneys. See, people with bad kidneys cannot eat too much protein, because there is nitrogen in the protein. And with bad kidneys then nitrogen builds up in the blood. So some people will say, "Wait a minute. If your kidneys are bad you can't eat more protein. So you better not eat more protein or your kidneys will go bad." See, cart before the horse. One thing doesn't lead to the other. There is no reason to think protein would damage your kidneys. But still you hear people who really ought to know better saying don't eat protein because it is harmful. And it just isn't true. What you want is to lose weight. So the question for you is not what can you get away with. The question is not what can you get by with so you won't get sick. What you want to know is how much protein is best for you, so you have an easier time losing weight. There have been lots of scientific studies to see what protein does to weight loss. And here is what all the studies have shown. They take a group of people and give them low protein diets. And they give the other group of people high protein diets. Reduced calorie diets with more protein cause more weight loss than those with less protein. On a diet with more protein you will lose more fat and you will lose less lean body mass. If you lose more fat and maintain more lean body mass you will not gain the weight back so easily next time. This is vital. On the other hand, on a low protein diet you will lose more lean mass. And you will gain weight more easily when you come off the diet. So let's just use some plain old common sense. Food has to be made of something. You've most likely got plenty of fat in your diet. You don't need more of that. And you probably get plenty of sugar in your diet. You don't need more of that. If you have more protein then you have a chance that some of that protein will made into something good. Like stronger muscles. Or a better immune system. Or hormones that your body needs. See, something good. Something strong. If you eat more protein you will lose more weight. You will have less body fat. You will have more lean mass. So the simple common sense answer to all of it is this: you will lose weight more easily if you eat more protein, and since it doesn't do any harm then that is what you should do -- eat more protein.